Mr. Weston led the staff in a welcome back session on Tuesday, August 9th by sharing his vision for the future of education at Mena Public Schools. Four initiatives of innovation include our partnership with Aramark food service, our K-12 academies of alternative education for "any place, any time, any pace" learning, The Blade Learning S.T.E.M. grant for Mena Middle School, and our release of the new district website and our mobile-friendly communication tools. Mr. Weston discussed the importance of building relationships with students. He emphasized that positive "attitude, tone, and temperament" improves the culture and climate for learning. T.E.A.M. Mena's theme for this year is "W.O.W". 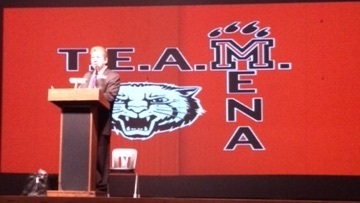 Mr. Weston along with the Mena administration team rolled out the "Worth Over Work" concept. It is important that every staff member touches the heart of the student before attempting to educate one. Mena Public Schools is proud of the work we do, but we believe that building trusting relationships with our students will change lives and inspire learning. "W.O.W" what a great year we will have!